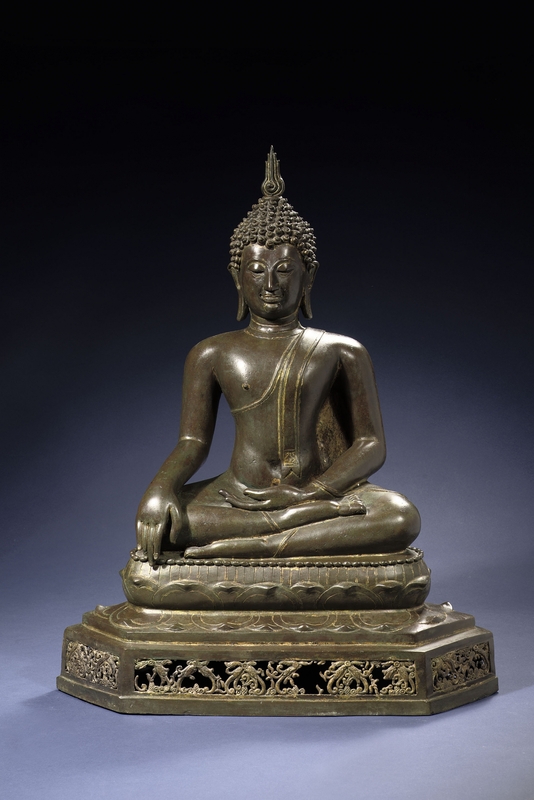 A bronze sculpture of the historical Buddha clad in a simple, skintight monk's robe. Buddha is sitting in the Dhyanasana position on top of a lotus throne. This is the sitting position known as 'the meditation pose' in which the legs are crossed with the soles of both feet turned upward and resting on the opposite thighs. The lotus throne is placed upon a openwork pedestal decorated with foliate patterns. His left hand is lying on top of his legs, his right hand hangs over the right knee with the palm inward and the fingers extended. This is the bhumisparsa mudra; the 'touching the earth' or `calling the earth to witness' mudra. It symbolizes Sakyamuni Buddha's victory over Mara, when he vanquished the Evil One and called the earth to witness his victory. His eyes are halfway closed and he has a faint smile on his lips. The flame of enlightenment appears on the usnisa that is rendered as a hairdo, covered with numerous right-turning curls. 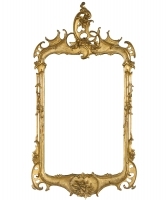 The sculpture is covered with an even and wonderful green-brown patina, with some traces of gilding, overall. His facial features and other details such as his fingers and toes are sharply defined. Buddha: 'the enlightened one' or 'the awakened one'. Thirty-two major and eighty minor bodily signs identify a Buddha. Numbers of Buddhas have been identified and/ or named. The manuscript Lalitavistara names 54 Buddhas. Buddha was the title given to Siddhartha Guatama, the son of a Nepalese rajah. According to tradition, Guatama left a life of luxury at age 30 and devoted himself to years of contemplation and self-denial, finally reaching enlightenment while sitting beneath a tree. 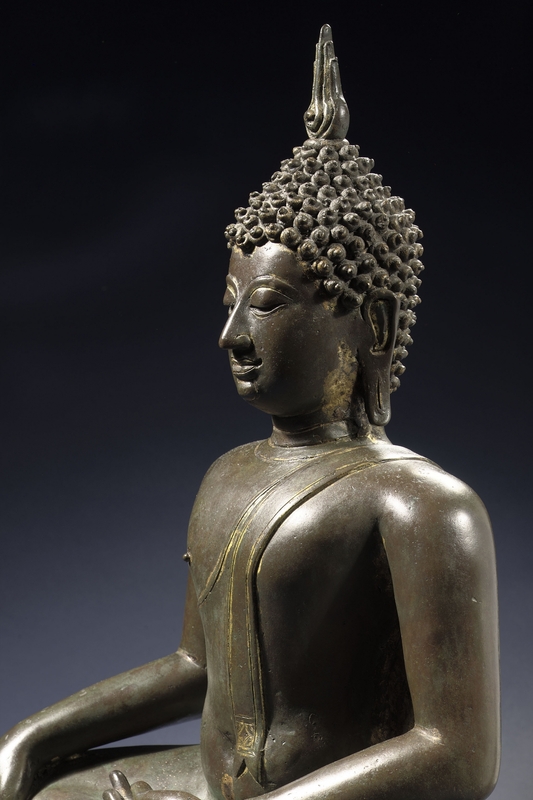 Henceforth known as Buddha, he spent his life teaching disciples about his beliefs (embodied in the Four Noble Truths) and the goal of achieving the enlightened state of Nirvana.